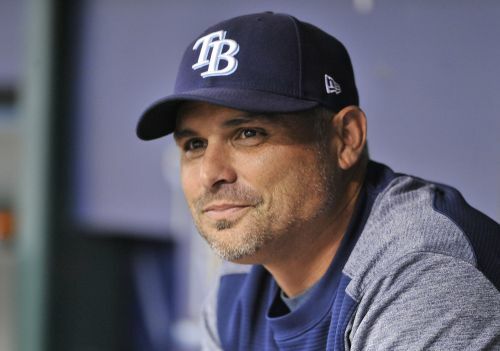 ST. PETERSBURG, Fla. (AP) — The Tampa Bay Rays, who won more games than any American League team that didn't make the playoffs, have rewarded manager Kevin Cash with a contract extension that runs through 2024, plus a club option for 2025. The 40-year-old Cash had one year remaining on a five-year, $5 million deal he signed when he replaced Joe Maddon after the 2014 season. Financial terms were not disclosed. Both Cash, who had no previous managerial experience when he was hired, and management said it was an easy decision to continue their relationship after a bounce-back season. "Kevin has a long list of positives. ... It's been a joy to see him blossom," general manager Erik Neander said Tuesday. "He's very deserving of this extension. We're excited for the years ahead." The budget-minded Rays surprisingly won 90 games, finishing third in the AL East behind the Boston Red Sox and New York Yankees, despite trimming payroll last winter and purging the roster again in July to transform themselves into a young team with a promising future. Cash, who turns 41 in December, has led the Rays to a 318-330 record over four seasons. "There's reason to be really excited about the way our team played, the youth and the athleticism, and the way these guys really came together in the second half of the year," Cash said. "I'd like to think, other than the teams that are playing playoff baseball right now, we might have been the most talked about team in a positive light at the end of the season," the manager added during a conference call. "It's an honor to be a part of that." The Rays lost 12 of 15 to begin the season, digging themselves into a hole few people thought they were capable of escaping after trading Evan Longoria, Steven Souza Jr., Corey Dickerson and Jake Odorizzi and losing starting pitcher Alex Cobb to free agency. The club chopped more salary in July, trading pitchers Chris Archer, Nathan Eovaldi and Alex Colome, as well as catcher Wilson Ramos and outfielder Denard Span to make way for younger players. With first-time All-Star Blake Snell leading the majors with 21 wins and an AL-best 1.89 ERA and Cash overseeing an innovative plan to use "openers" and "bullpen days" to compensate for a shortage of proven starting pitching, the Rays went 41-25 after the All-Star break, including 19-9 in September. "This is a year we put a lot on his plate," Neander said. "We made a lot of moves all the way into spring training that left a lot of doubt, potentially within our clubhouse with respect to what we could accomplish this year. "To see him navigate that, to see him navigate the difficult stretch we had out of the gates, the maturity, his approach, the unwavering support he had from our coaching staff ... was really impactful" and makes Cash the right man for the job "not only today, but for the forseeable future," the GM added. Cash doesn't anticipate the extension creating additional pressure because expectations have remained consistent for an organization that made the playoffs four times in six seasons from 2008 to 2013. "The expectation is to go out there and find ways to win," Cash said, "and we get to do it with a really energetic group of players."